When we refer to rivers that flow downhill, we call the path that they follow their course. Most rivers have upper, middle and lower courses. The former is closest to the source of the river and the latter is closest to the mouth of the river. Naturally, the course that a river follows affects the landscape that surrounds the river because of processes like erosion. We can also see deposition occurring along the course of rivers. This is where materials are picked up by the river and deposited somewhere else. Generally, either erosion or deposition will be a dominant force. There are two ways in which you might be asked to identify a river during your examination, they are long profile and cross profile. The cross profile simply shows us a cross-section of the river, while the long profile shows us how the gradient changes over the course of the river. If you are offered a cross profile diagram of a V-shaped valley with steep sides and what appears to be a small amount of water in the bottom, then that usually means that you are looking at the upper course of a river, where the gradient is steep. 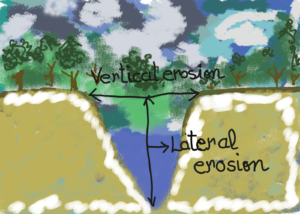 If you are offered a cross profile diagram of a valley that appears to have sides that slope gently and quite a deep channel of water in the bottom, then that usually means that you are looking at the middle course of a river, where the gradient is medium. If you are offered a cross profile diagram of a valley that appears to be flat with a deep and wide channel of water, then you are probably looking at the lower course of a river, where the gradient is gentle. Erosion shapes the landscape around rivers, but two types of erosion are actually occurring at the same time. Vertical erosion is really easy to spot because we can see how deep the river valley is when we look at cross profile diagrams. We can usually see the most vertical erosion in the upper course. If you take a look at a cross profile diagram of a river, then it is easy to see that rivers widen at certain points. They usually start off narrow in the upper course, so a wide river tells us that we are looking at either the middle course or the lower course. When we are talking about erosion, abrasion is one of the key factors that plays a prominent role. As rivers flow, they pick up material. This material can then scrape along the sides of the channel. Before abrasion can take place, hydraulic action has an important role to play. The sheer force of the water in the river breaks rock particles away. These are then carried by the river, scraping along the sides of the channel. We can also see attrition occurring. This is where rocks that have already been eroded hit each other and become smaller. As this happens more, they lose their jagged edges and become rounded, like pebbles. This process means that particles get smaller as they travel downstream. Solution also occurs in rivers. This is where some types of rock are dissolved. Solution occurs because of the way that soluble materials dissolve when they are in the river. They are still carried along in the water, but in a dissolved state. Suspension is slightly different, but it might help you if you imagine that the particles involved in suspension are a tiny bit heavier than soluble particles. These are particles that do not dissolve, but they are easily carried along by the water. Saltation involves particles that are too heavy to be simply carried along by the water. They are usually still small enough to bounce along the river bed because of the force of the water. Traction involves heavier particles than the ones that we can see in saltation. These particles are too heavy to bounce along so they are simply pushed by the force of the water. Now that you know what happens during erosion and transportation, it is important to learn what happens to all of these particles and where they actually end up. We call this process deposition, where eroded materials are dropped by the river. You will more than likely be asked about why deposition occurs. Deposition can occur for a few different reasons. For example, if the water becomes shallower, then deposition can occur. Deposition can also occur if the amount of material that is present increases or if the volume of water in the river decreases.